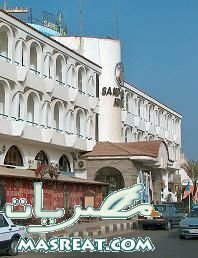 You can reach Hurghada by bus from Cairo. The trip usually takes approximately 7 hours depending on the operator. Known operators include the Super Jet. There are a number of Stations which include one in Medan El Giza in northwestern Cairo, Ramsis Station in downtown Cairo, or Almaza Station in the Heliopolis district in northeastern Cairo. Your hotel or a travel agency associated with your hotel will be able to arrange excursions to nearby attractions, including Luxor. Luxor is about 4 to 5 hours by bus, and your tour operator will be required to leave and return at designated times in order to travel in a police escorted convoy (of approximately 150 other tour buses.) There is also a new highway which is currently being built to service people to be able to go from Hurghada straight to the west to cities such as Assiut and and Kenna. Taxi drivers in Hurghada have astounishing talent on spotting tourists far far away, you only need to look at the apporoaching car and they'll stop for you. So it's easy to get a taxi from anywhere at any time, but getting to the right place with the right price might not be so easy at first. Before stepping in, find out if driver speaks any english, and show the wanted destination from the map. There are only few streets with names, so destination is specified with nearby places, a hotel for example. It's always safe to get out in front of the hotel. Discuss and agree the total price (not per person) with the driver - do remember to haggle it down to something like 5-10LE when travelling inside the same part of the town and 20LE when travelling from downtown to Sekalla for example. It's not recommended travelling with the meter on, becouse there might be some tourist-extra. After the driver agrees on a price, jump in. The method to avoiding the confrontation with the drivers is to have correct amount of money you agreed at first, pass the money on at destination, get out and walk away.. don't waste your time arguing with drivers as it only causes distress; usually you paid more for the same ride than a local person would have. Another thing to note, if you pay with a 5LE (5 Egyptian pound note) they can and do try to switch it for a 50 peasters (the lessor denominator) and then they request the original 5le you have already paid. Piaster notes are smaller than pounds.